This article appears in “Open Source For You” Magazine in June 2015 Edition. Its a simple and easy tryout. If you are a startup and cannot afford for software cost, here you go, its completely free. This tool is completely open source and API is provided for deploying in local server. Also there is a developer version available for continuous development of the software. 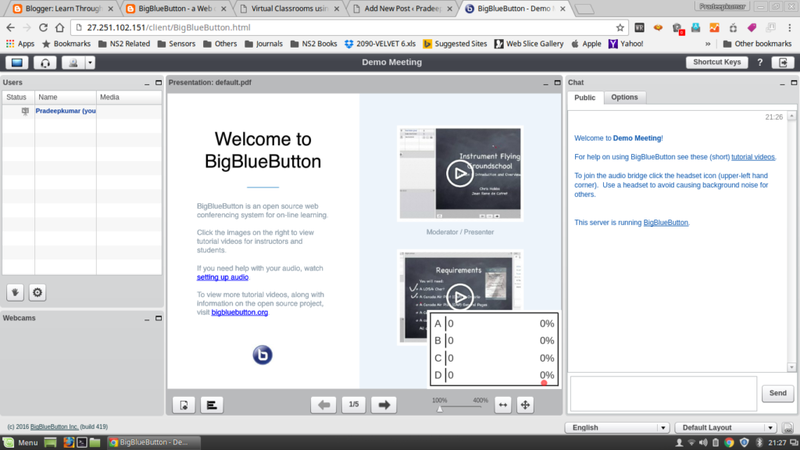 BigBlueButton divides into three windows within a browser, the left side window shows the list of users joined during the session, the web camera control, audio, video control, etc. 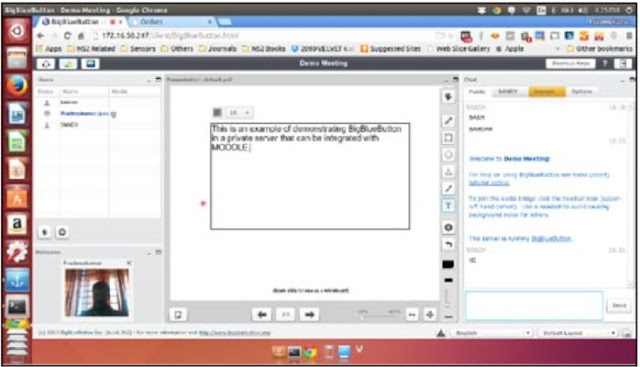 The middle window shows the whiteboard wherein the teacher can write, scribble, type, draw, etc to broadcast it to all the listeners and the right side window is a chat window in which all the users chat as a group or individually they can chat with the teacher or other users. BigBlueButton currently released the 0.9.0 version that can installed mainly on a Ubuntu 14.04 OS that is released with Long Term Support (LTS). Here are the recommendations before installing in a server. Installation of BigBlueButton in a server is a long process that consumes around 500MB of software to be downloaded and takes around 2 to 3 hours to complete. Once the upgrading is over, restart the OS and now to install the LibreOffice. Ubuntu comes with LibreOffice 4.2.7 and BigBlueButton uses LibreOffice 4.3 for document conversion, so the PPA for LibreOffice 4.3 version have to be added. The local machine need to access the BigBlueButton server, so the key have to be installed. Here is the command for installing the key. ffmpeg is a software that needs to be installed since it creates the playback components like audio, video, presentation, desktop sharing, etc. This tool needs other dependencies also, so a group of tools have to be installed. Also there are some customisation in the OS. So the entire code is pasted in a shell script and the script runs the command one by one. (This process will take almost more than an hour to install ffmpeg and it adds some modules into the kernel to support the audio, video, etc. –clean will clear all the log files of bigbluebutton and –check will search through and find any errors. See the Figure 2 for the –check command. The IP address allocated to my server is 172.16.50.247 (its a local IP). To check the status of my server, you can see the Figure 3. Once the demo server is opened, just distribute the IP addresses and the users can connected to the IP and they can join the session. During the first time, the browser checks for devices like Microphone, Speaker and Web camera. The users are having the option of joining the session only as a listener or both listener and a speaker. In case, the user need not allow the browser to access the device. 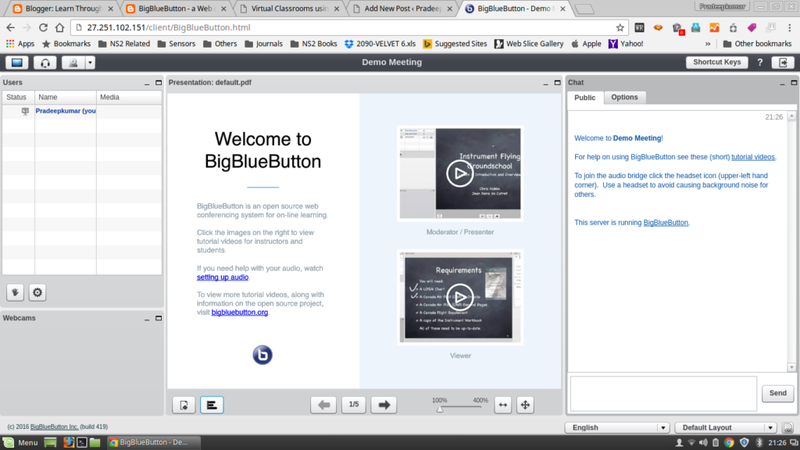 This is to integrate MOODLE and BigBlueButton so that a teacher can create an activity within MOODLE and the students can join themselves in the session. The teacher have the entire control of the session. The students can join the session, only after the teacher joins the session. Also the session can be recorded by the teacher and may be used for later use. Figure 5 shows the demonstration of a lecture on a white board wherein a teacher is typing an information and there are two other users in the session listening. The users are viewing the video of the teacher and they can send messages to the teacher through the window provided in the right side column. Using these open source tools MOODLE and BigBlueButton, huge amount of money can be saved in learning and colleges/universities across the country come forward to motivate students and faculty members to learn/use open source tools for their learning. Edit: Now recently Big Blue Button added a new functionality called “Poll”, in which a speaker can ask for a question and answered by the listeners anonymously and the poll can be shared instantly to the viewers.